The modern rush to reach the next big door-buster has stolen our ability to relax through Thanksgiving dinner. There’s no deal greater than Jesus’ birth, and we don’t have to wait in line for it. Christmas gives us the opportunity to reflect upon the plight of the last year of life. John encourages us to stay focused on what’s important, the long journey of our earthly lives to be more like Christ. We can aim right at that goal, because He was born to earth as an example of what to shoot for. Christmas is an encouraging reminder to stay focused on the reason for the season. The simple joys connect us to the One who once walked where we trod. When my children were growing up, one of their favorite stories was about a llama that lost sight of the season, and melted down to the gourd in a tantrum of lost holiday priorities. Sometimes, we have to schedule-out our selfishness, and get busy loving other people. Compassion towards others extends His love to them. Time in God’s Word is especially important amidst the commercialism of the season. He promises to reveal new layers of the same Christmas story that we can apply to this season of our lives. When we offer Him our first minutes, we being to see Him throughout the day. The surrounding soundtrack of our lives can take a toll on our hearts, especially if we spend most of our time drenched in secular media. Christmas is a great time to reboot our thoughts by adjusting the message we are tune into. The Word weaved into Christmas carols has the power to move our hearts into the correct place. Before squeezing other event onto a calendar square, we can pause to pray for discernment on whether an additional event or commitment is necessary. “Thank you for thinking of me!” we can reply in the meantime, “I’ll get back to you.” This Christmas, let’s put the magnitude and majesty of the King of Kings at the center of our holiday planner. Father, Praise You for Christmas! Thank You for Jesus, born to earth to live among us and pay the ultimate price for our sin. Along the way, He lived a life that we can look to as an example of how to navigate human life on earth. Belief in Him reaches beyond this life, and unto heaven. 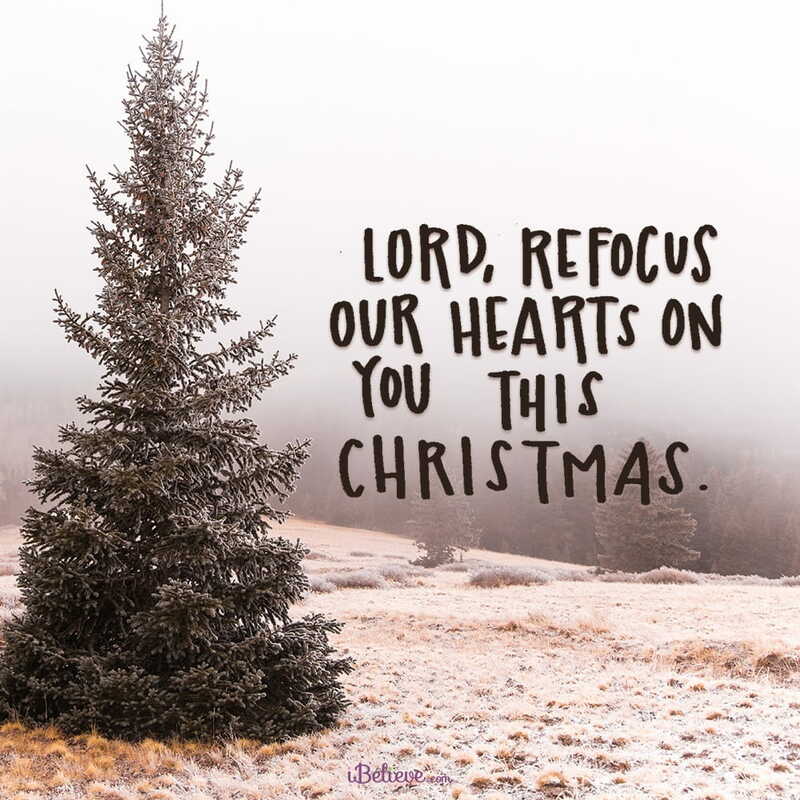 This Christmas, we ask your forgiveness for getting caught up in the hustle of commercialism, and ask that You re-focus our hearts to Christ. Help us to experience His presence and revel in His closeness. In Jesus’ Name, Amen.